The LR-0 research reactor is a light-water, zero-power, pool-type reactor. It serves as an experimental reactor for measuring neutron-physical characteristics of VVER (Water-Water Energetic Reactor) type reactors. It provides a scientific and technological facility for experiments in the area of active zone physics and shielding of light water VVER (Temelín, Dukovany and other Russian-design reactors),experiments related to the storage of spent fuel from nuclear power plants and providing advice for the nuclear power industry. 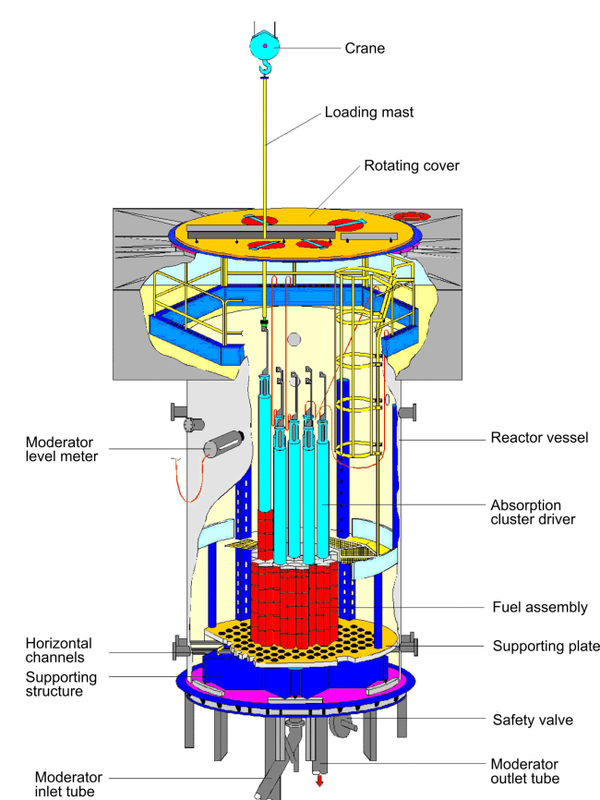 The LR-0 reactor has been designed in a universal manner, suitable for physics experiments on VVER-type active zones with a wide range of cartridge quantities, fuel enrichment, along with various concentrations of H3BO3 in the moderator and configurations of absorptive elements in the cartridges etc. A very important part of research is the modelling and experimental verification of radiation damage to materials used in internal reactor assemblies and VVER reactor vessels. The design of the LR-0 reactor took into account specific requirements for both the reactor safety under all operational conditions, and of its purpose for physics research of VVER-type active zones. Neutron field modeling for power plant reactors. Benchmark-type experiments at a 1:1 scale applied radially to VVER reactors. A wide range of experimental modeling options with a high degree of reproducibility of parameters. Flexible zone reconfiguration and flexible reactor operation. The ability to design and operation multi-zone active zones, e.g. substitution zones with an internal insertion zone in hexagonal or square geometry (using standard LR-0 fuel assemblies). Standard and special support plates for mock-up experiments. Special support plates allowing triangular asembly arrangement with an arbitrary pitch. A wide range of measurement technology including equipment and experienced staff. Measurement of neutron flux distribution in pins and fuel assemblies with and without control clusters – radial and axial fission density distribution . This serves to verify and fine-tune numerical models (benchmark measurements), study fuel depletion, etc. Spent fuel storage – experimental verification of nuclear safety in relation to proposed geometry and various absorbing materials. Models of VVER-440 and VVER-1000 fuel assemblies – measurement of neutron flux distribution from the perspective of biological shielding and other dosimetry purposes (e.g. measurement of reactor pressure vessel dosages). Space-time kinetics for assembly of benchmark data and codes. Neutron- physical reactor parameter research and verification – integral and differential efficiency of control and emergency clusters, critical surface level, surface reactivity coefficient. Experiments with new fuel assemblies distribution designs – influence of new profiled fuel assembly and grid materials on flux density distribution. Influence of control assembly in VVER-400 zones – measurement of neutron flux distribution in fuel with a partially inserted control assembly. Measurement of neutron flux distributions in elements with molten salts for the SPHINX programme as part of international cooperation on the EURATOM project. In the reactor, a fission reaction occurs between thermal neutrons and uranium in fuel rods containing the fissile isotope U235. The reaction is controlled either through the level of moderator or by experimental clusters. The moderator, which slows neutrons to a velocity suitable for further fission, consists of de-mineralized water. It contains dissolved boric acid (H3BO3) with a concentration up to 12 g.l-1, which serves as an additional neutron absorber. The reactor’s power is low, with a maximum thermal output of 1 kW, which is not nearly enough to heat the water in the reactor (roughly 20 m3) by even one degree Celsius. This power is not even one millionth of the power of the reactor in Temelín, so LR-0 reactor design is much simpler – nevertheless, the same physical laws apply inside it, so it can be used to investigate the characteristics of much larger reactors. The safety of the reactor is achieved by a number of safety elements, such as redundant control units and logic that selects two correct signals from three devices connected in parallel. All important equipment is part of the safety chain, whose breakage immediately shuts down the reactor. Reactor shut-down is also under control in the case of a power loss (for example, selected signalling from open emergency moderator vents and indication of the lower position of emergency clusters are battery-powered). The LR-0 reactor is shut-down not only via insertion of absorption rods like in power plant reactors, but also quick moderator drainage into storage tanks. Nuclear fuel is placed into the active zone in various geometries according to the support plate used based on experimental requirements. Aside from fuel and absorption clusters, the zone also includes dry channels for measuring instruments consisting of aluminium tubes with diameter 80 mm and thickness 4 mm. Basic symmetrical core configuration consists of 7,19,31,55,85,121 fuel assemblies. The moderator slows down fast neutrons created during uranium fission to thermal velocity and thus allows further uranium fission to occur. De-mineralized (very pure) water is used as a moderator, sometimes with dissolved boric acid (H3BO3) at concentrations between 0 and 12 g.l-1, which serves as an absorber of neutrons for reactor control (on LR-0, as opposed to a real power plant, the concentration cannot be changed during operation). VVER 1000 – is a version of a casingless reactor fuel assemblies shorted to 1/3 (Temelín 3.5 m) with standard or regular configuration. It is composed of a support framework (one central and 18 guide tubes and a variable number of separation grilles), into which 312 fuel rods are placed. The stainless steel guide tubes carry cluster absorption elements. Along the axis of the fuel assembly is a central tube for internal reactor measurements (e.g. temperature, pressure or neutron flux). The active part has a total length of 1250 mm. Fuel rods from zircon alloy are filled with tablets of pressed UO2 ceramic powder. VVER 440 – similar to the preceding type, but is composed of only 126 fuel pins. The cartridge has an aluminium sheet metal casing and has no guide tubes for absorption clusters. Absorption clusters are used to control reactor output. They consist of 18 rods with an absorber bound together into one bundle that is pulled out of the nuclear fuel by electric motors under control of the reactor’s operator. In clusters boron is also used as an absorber, this time as a white solid, B4C. During operation, at least 6 cluster are fully pulled out of the core and dropped into the core when the reactor needs to the shut down – emergency clusters. Other, (“experimental”) clusters can be configured in arbitrary positions upon reactor startup according to experimental requirements. Usually 6–16 clusters are used in the reactor. Output can also be controlled by changing the level of the moderator. A 241AmBe source emitting 6.6 × 106 neutrons s-1 is used. It is located in a container under the reactor vessel, and during reactor startup a pneumatic mechanism moves it into the reactor to provide the first neutrons for safe reactor start-up. Once the chain reaction has started and stabilized, the neutron source is moved out of the core by the operator and is no longer used during operation. A stationary dosimetry system measuring beta and gamma radiation dosages is used to monitor the radiation situation in the reactor’s immediate vicinity. It emits sound and light signals when set limits have been exceeded. In the 1960’s TR-0, a heavy water reactor with zero output, was built for research of neutron-physical characteristics of the active zone of the KS-150 power reactor (Jaslovské Bohunice A-1). It was commissioned in 1972 and operated until 1979. Due to our and the global nuclear industry’s switch from heavy water to light water reactors, the experimental heavy water programme was ended in 1975, and after partial reconstruction, measurements continued with a light water insertion zone LVZ-I in the heavy water power zone during the years 1976–1979. Around 1980, the reactor was completely rebuilt into reactor LR-0 – an experimental light water reactor with “zero” output. Since then, LR-0 has served mainly for research of active zones, storage lattices and experimental modelling of VVER-1000 and VVER-440 type reactors. The reactor was put into permanent operation in June 1983. Nuclear fission reactors are based on the release of energy during the fission of some heavy atoms. Fissionable materials include mainly uranium 235U, but also 239Pu, 233U and others. Aside from 235U, all other fissionable materials have to be artificially produced, so for the time being only 235U is used on an industrial scale. But even it is present in amounts of less than one percent in the natural mixture of uranium isotopes, so for use in reactors it must usually be “enriched” by removing the majority isotope 238U, to increase the share of 235U to around four percent, which is enough for regular nuclear reactors. Uranium fission occurs when the nucleus is struck by a neutron. During fission, energy of around 200 MeV is released which means that in theory the fission of one gram of 235U can release around 2 MWh of energy. In practice, efficiency is orders of magnitude lower due to low effectiveness of nuclear fuel burnup and thermal cycle efficiency during the conversion of thermal energy to electricity. Despite this, nuclear fuel has on the order of a million times more “thermal power” than fossil fuels. An important characteristic of fission is that aside form releasing energy, it also produces two to three neutrons that can cause further fission. This is why once the nuclear reaction has been started up by the “first neutron” (for which an external neutron source is often used), it then keeps itself going – this is a fission chain reaction. Neutrons created during fission have high energies and thus velocity. Thanks to this, there is a relatively low probability that they will manage to split more uranium before they fly out of the reactor. Nuclear fission works in this way only in so-called fast reactors. To facilitate the fissioning of uranium, there is a moderator present in the reactor – a substance whose task it is to slow down the fast neutrons from nuclear fission so that they can easily split another uranium nucleus. Reactors based on this concept are called thermal. Thanks to high neutron velocities, fast reactors have to have larger dimensions or more enriched fuel, and their regulation is relatively more complex. Their advantage is higher uranium burnup efficiency – thanks to this, in the future, once the world’s sources of uranium being to dry up, it is expected that this type of reactor will come into wider use. Right now, thermal reactors are more predominant on a global scale. Their advantages include a simpler design, easier regulation and when properly designed higher nuclear safety thanks to self-regulating characteristics. Their disadvantage is worse utilization of fuel – about 80 % of the 235U in fuel remains unused in the depleted fuel (accumulation of fission by-products make further use impossible).